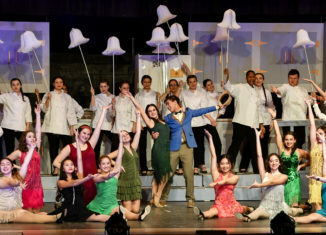 There is certainly no surprise that the thespians of Half Hollow Hills High School East produced yet another incredible and passionate performance for the annual Spring Musical. This year, the High School East Players presented The Drowsy Chaperone on March 22nd and 23rd. For those who did not get to experience the fantasy and drama of the incredible show, The Drowsy Chaperone is a humorous production which is essentially a show inside of a show. The Man in Chair receives a record of the musical, The Drowsy Chaperone, from his mother. The show consists of The Man in Chair narrating to the audience through the record, which is performed as the Broadway show it was intended to be. The main characters of the actual show are Janet Van Der Graaf, Robert Martin, Mr. Feltzig, Kitty, Mrs. Tottendale, Underling, Drowsy, George, Aldolpho, Gangster 1, Gangster 2, and Trix the Aviatrix. The plot of the show is that Janet Van Der Graaf, a famous and successful star, was going to give up her “life of glamour to tie the know” with Robert Martin. After tricking him to “cheat” on her, she calls the wedding off. The entire cast of supporting characters makes for a hilarious show filled with catchy songs and outstanding dances. To no one’s surprise, the cast was unbelievable. The principles included Ben Keschner as Man in Chair, Alyssa De Villa as Janet Van Der Graaf, Frankie Altamirano as Robert Martin, Sam Abramson as Mr. Feltzig, Hannah Gerber as Kitty, Jolie Brandstein as Mrs. Tottendale, Danny Connell as Underling, Grace Bleck as Drowsy, Dylan Weber as George, Matthew Rubinfeld as Aldolpho, Justin Frank as Gangster 1, Andrew Glick as Gangster 2, and Amanda Janko as Trix the Aviatrix. The incredible ensemble cast was led in choreography by Dance Captain Xinwen Zhang, with assistant dance captions Allyson Adam and Lindsay Lao. The dance numbers were made even better with the inclusion of the featured dancers and featured tappers. Including the principles, featured dances featured tappers and ensemble, the cast was made up of over 65 incredibly talented performers. In addition to the cast, the show could not go on without the unbelievable stage crew and the pit orchestra. To the supportive crew: you are all unbelievably talented and the musical would not be possible without you each year. The fact that we had a set on stage two weeks before the opening of the show was incredible, and each year you exceed all of our expectations. In addition to the acting, dancing, and singing talent, our high school is lucky enough to have an extremely talented, experienced, and dedicated pit orchestra. The music in our productions is very much comparable to the music in the original cast recordings – something that is very hard to accomplish. The talented musicians of HSE make it look too easy to be true. Not only are our students talented beyond belief, but the students also have been extremely fortunate to work with such influential and creative adults. Co-directors Karen Romeo and Danielle McRoy, musical director Michael Sydor, orchestra conductor Monica Benstock, crew advisors Vikki and Torry Reres, costume coordinator Debbie Parker, and choreographer Eliana Kayelle Lichtman were truly the backbones of our production. On behalf of the whole cast, crew, and pit, we are all so grateful for everything each one of you has provided for us and your contributions to the show. Without each of you, we would have no acting or singing abilities, no dance numbers, no music, no sets, and no costumes to make us look as fabulous as we did on stage. Thank you so much; we love you. I am currently a senior, and this is was my second and final year involved in the spring musical. As I reflect on my experiences not only in the musical but also as an active student of the music wing, I realize how fortunate I am to have been a part of the incredible music program. With each rehearsal, practice, and lesson, I have not only grown as a music student but also as an individual. I have learned some of the most valuable lessons in my music-related activities that I will continuously carry with me and remember for the rest of my life. The people that participate in these activities with me are truly considered some of the best and most courageous individuals I have ever come across; for this, I am grateful. I will forever cherish all of the incredible and unforgettable memories I have made in that music wing, and I will never take for granted the experiences and friendships I have formed while doing so. Thank you to the entire cast, crew, and pit for making this show, and my overall experience these past four years truly amazing.